Z Reciprocating Saw Blade Set, 10 pc. 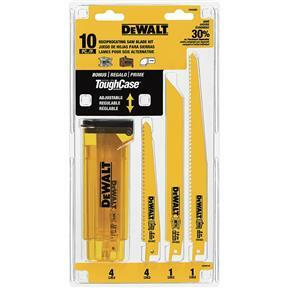 DeWalt DW4898 Z - Z Reciprocating Saw Blade Set, 10 pc. 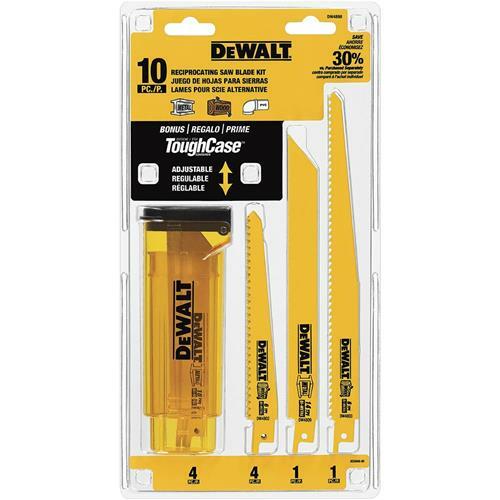 From the manufacturer: The DEWALT DW4898 10 Piece Bi-Metal Reciprocating Saw Blade Set with Case is a convenient set of reciprocating saw blade for your wood and metal cutting needs. This set includes: four DW4802 6-Inch 6 TPI Taper Back Bi-Metal Reciprocating Blades for General Purpose Wood Cutting; four DW4811 6-Inch 18 TPI Straight Back Bi-Metal Reciprocating Blades for heavy metal cutting; one 8-Inch 14 TPI Straight Back Bi-Metal Reciprocating Blade for metal cutting; and one 9-Inch 6 TPI Taper Back Bi-Metal Reciprocating Blade for General Purpose Wood Cutting. These blades come in an adjustable size tough case that is designed to fit in you kit box or storage bag for easy convenient storage.